I’m not feeling well for many days, so I miss my oven very much. But I’m just recovering so I don’t want to make anything so complicated. By flipping through the book I find this one quite easy to do. The recipe is coming from ............(I talk about it before). The original recipe makes 4 pieces but today I make a big one instead, you can follow this instruction for 4 pieces or bake the big one like me but the time will be about 20-25 minutes. Put flour, yeast, sugar and salt together in a bowl, whisk to combine. Form a well in the center; pour in the water and olive oil. Begin to mix with hand until the dough comes together. Turn out onto a floured surface and knead for about 5 minutes (or 100 time), until smooth and no longer sticky. Place dough in oiled bowl and turn to coat with oil. Cover with a damp cloth and put in a warm place free of drafts for 1 to 1 ½ hours. Dough should be doubled in bulk. Take the dough out of the bowl and knead for a few minutes then divide into 4 pieces and roll the dough into balls and let the dough rest for 10-15 minutes. Roll balls into circles on a lightly floured surface with floured rolling pin. The circles should be about 5-inch in diameter. Let the dough rise for about 30 minutes in a warm place. About 10 minutes before baking, press fingertips all over dough, forming indentations, and drizzle olive oil over dough. 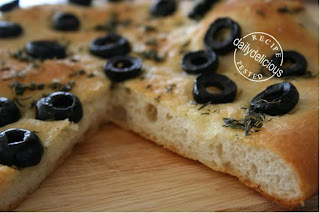 Sprinkle olives and chopped Thyme evenly over the dough. Place dough on oiled baking sheets and bake about 15 minutes. Remove to wire racks to cool.